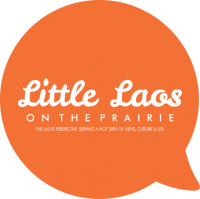 It’s the holiday season and while we know the Lao way of celebrating isn’t just eating holiday hybrid favorites like honey-baked ham with a side of sticky rice and jeow, it’s also about giving. The reflections of the past year, what it means to be in tuned with one’s self, and building community one hopes to see. During this season in Laos, it’s Winter. The sunshine peaks sometimes, but with temps that reach as low as 20 degrees F in some remote villages, and without access to properly insulated walls, heat and thicker clothes– it can get pretty cold. This week, two young Lao Diaspora noticed the need, gathered donations, and hit the road to give to villages in need. Thouni Seneyakone, who is a Lao Minnesotan living in Vientiane, works for Village Focus International. Their team went to eight villages in Salavan province and Sekong Province, to give warm clothes and blankets to villagers and children, reaching more than 1,000 villagers. “I started this initiative because for this holiday season, I’ve focused on fundraising in Cambodia all year and didn’t have time to do something for the Lao people. So I thought it would be a good idea to donate warm clothes and blankets to the needy”, said Thouni. Village Focus International (VFI) is an NGO based in the U.S., Hong Kong, and Cambodia and was founded in Laos in 2000, working in areas of anti-trafficking, women and children empowerment, healthy communities, local leadership capacity, and land security. Thevarith Chanthavone, a Lao American from Connecticut living in Vientiane, is founder of the nonprofit organization, The Chanthavone Football Club (T.C.F.C. ), started on the road this week for their Christmas Sports Celebration, visiting villages in Laos with donations of football kits, school supplies, and basic hygiene kits. “It’s about the kids. Everything is about the kids and their well-being. I love working with them”, said Thevarith, who is a lead Physical Education Teacher and Athletics Director at Vientiane Pattana School. It’s the act of het boun (merit/giving to others) that’s reflective of what ‘Lao compassion’ means to these villages. As more Lao Diaspora return to Laos, they make up the majority of contributions to their respective villages. To those who give, it’s more than just seeing the grateful faces of happy children and relieved parents that matter, but giving back to one’s community through a simple act of kindness reaches, transcends and transforms. Learn about other Lao diaspora here.